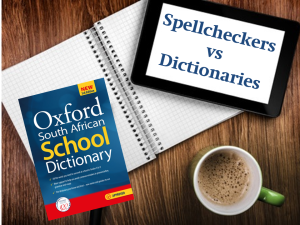 Oxford SA Blog | With spellcheckers, why do children still need a dictionary? Home Dictionaries With spellcheckers, why do children still need a dictionary? With spellcheckers, why do children still need a dictionary? Today almost every child has a cellphone, or access to one. With free mobile or online spellcheckers available, who needs a dictionary, right? Wrong! Spellcheckers have a limited function when it comes to writing grammatically and using punctuation correctly. And as for spelling accurately, a spellchecker just isn’t intuitive enough to take into account different contexts, senses or meanings. So let’s ask the question again: What do kids need dictionaries for? A dictionary will help to clear up those spelling issues that could cost your child valuable marks, such as confusable words. Example: Don’t confuse there [adverb] and their [adjective]. These words sound the same but have very different meanings: He’s over there near the door. Those are their shoes, not mine. Oxford school dictionaries define words using a context that is familiar to and appropriate for your child’s age, with example sentences to illustrate how these words can be used at their best. Where a word has more than one meaning, each one is numbered. Example: peculiar (adjective) 1 strange or odd. SYNONYMS: curious, funny, odd, weird. 2 belonging exclusively to a particular person, place or thing > customs peculiar to the 18th century. SYNONYMS: distinctive, individual, characteristic. 3 (formal) particular or special > a point of peculiar interest. Dictionaries will help to extend and enrich children’s vocabulary, which at school can help them use language more effectively and improve their marks. Example: hospital (noun) WORD BUILDING If you are very ill or you have an accident you go to hospital. A doctor or nurse gives you treatment and you are called a patient. You might need to have an operation. The room in a hospital where people sleep is called a ward. In multilingual South Africa, many children would like guidance on how to pronounce words they need to use at school. Oxford school dictionaries use respelling not phonetic symbols in their pronunciation guides, which makes it easy to work out how difficult words are pronounced. Example: knead (say need) PRONUNCIATION Don’t pronounce the k in words that start with kn. Dictionaries help a child to develop their writing skills by showing relationships between words, and how you can use grammar and punctuation to greater effect. Extra help is included on how to avoid common mistakes, for example in using an apostrophe correctly. Dictionaries give children so much more than just the right spelling. Sources: This article is based on an article available on the OXED website, URL http://fdslive.oup.com/www.oup.com/oxed/dictionaries/secondary_dictionary_letter.pdf?region=international. The examples above have been sourced from the Oxford South African School Dictionary 3rd edition (ISBN 9780195983968) and the Oxford South African Secondary School Dictionary (ISBN 9780195762235).